Academic Ophthalmology was established in the University of Auckland in 1968. However, funding for a full time academic appointment was extremely difficult to obtain until the extremely far-sighted and benevolent donations of Sir William and Lady Stevenson to fund a number of academic posts within the University. One of these posts was a senior lecturer position in ophthalmology and Dr Gillian Clover PhD, FRANZCO, was attracted back from the UK to be appointed as the first Sir William and Lady Stevenson Senior Lecturer in 1984. Due to her success in substantially further establishing academic ophthalmology, including research and teaching aspects as well as the creation of the New Zealand National Eye Bank, Gillian Clover was subsequently appointed as the Sir William and Lady Stevenson Associate Professor of Ophthalmology. Following the retirement of Associate Professor Gillian Clover, Dr Helen Danesh-Meyer MD FRANZCO who had recently been recruited as a Senior Lecturer following prestigious USA based glaucoma and neuro- ophthalmology fellowships, was appointed as the second Sir William and Lady Stevenson Associate Professor in Ophthalmology, the post she currently occupies. Although ophthalmology as an academic subspecialty has a long history in New Zealand neither of the medical schools had established a Chair of Ophthalmology prior to 1998. Due to the very generous support of Dr Maurice Paykel and the Maurice and Phyllis Paykel Trust, in conjunction with the Hadden Trust, Auckland Surgeons Eye Research Fund, the Royal New Zealand Foundation for the Blind, the University of Auckland, Auckland Healthcare Services Ltd. and several other individual and group benefactors, a substantial fund was created for the purpose of establishing a full Chair of Ophthalmology in New Zealand. 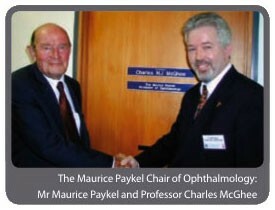 This foundation Chair in Ophthalmology, the first in New Zealand, was subsequently named in honour of the industrialist and philanthropist, Maurice Paykel. Professor Charles McGhee was recruited from a Professorial position at the University of Dundee and appointed to the Maurice Paykel Chair in 1998 - he took up the Professorial post in September 1999 and relocated from the UK with a six-member research team. 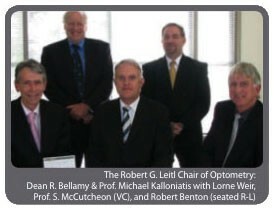 The Robert G Leitl chair is the second chair in optometry at the University of Auckland. It was established through a generous bequest from the estate of Robert G Leitl, who was a successful optical manufacturer in New Zealand. Robert G Leitl was involved with the optical industry from the mid 1940’s in his native Germany before moving to New Zealand in the mid-1960’s. Mr Leitl was a large contributor to the New Zealand Optometric Vision Research Foundation: a research fund providing small grants-in-aid for vision research. His support for optometry and research was also reflected in his Will where he stipulated to the trustees “to ascertain how the study of science and optometry could be advanced at the University - whether by making grants or scholarships or otherwise”. The trustees, Lorne Weir and Robert Benton, chose “or otherwise” and had extensive discussions with Professor Leon Garner and the Optometry Department. It was their combined opinion that the objectives of the Will would be best met by the creation of a Research Chair in Optometry. Professor Michael Kalloniatis is the current holder of the chair. 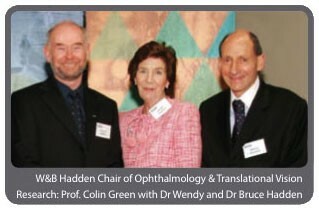 The W & B Hadden Chair in Ophthalmology and Translational Vision Research was funded by generous donations from Drs Wendy and Bruce Hadden, and bequests from the Sidney James Taylor and Helen Cadman estates. The Hadden trust has supported a number of initiatives in ophthalmology and due to this generous support of this second full chair in ophthalmology the University chose to name it in their honour. Professor Colin Green PhD DSc has worked in France, England and the USA. He won the International Robert Feulgen Prize for cardiac research in 1992 and has published in Nature and Science. He was founding Director of the University’s Biomedical Imaging Research Unit and attained a Personal Chair in Anatomy in 2004. In 2005 he was appointed as the first W&B Hadden Chair in Ophthalmology and Translational Vision Research. He is Regional Editor (Oceania) for Cell Biology International and on Editorial Boards for Clinical and Experimental Ophthalmology and Clinical Ophthalmology. Professor Green co-founded CoDa Therapeutics (NZ) Ltd in 2003 and CoDa Therapeutics Inc., USA, in 2005 His first product, Nexagon™ has entered clinical trials with a second platform, Peptagon™, developed for systemic applications.